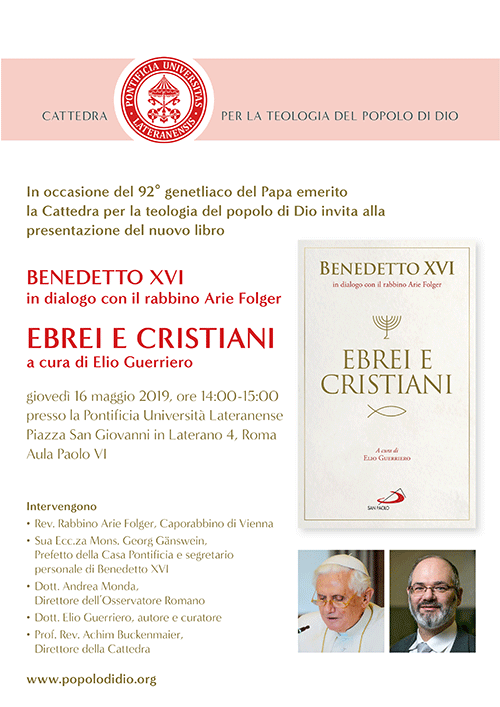 On Thursday, 16 May 2019 at 2 pm at the Lateran University in Rome, the Chair for the Theology of the People of God will present the Italian translation of the correspondence between Pope em. Benedict XVI and the Viennese Chief Rabbi Arie Folger. This correspondence was published by the Italian Benedict biographer Elio Guerriero. After Pope em. Benedict had published a contribution on the relationship of Judaism and Christianity in 2018, Chief Rabbi Folger wrote in the summer of the same year a remarkable response. This led to an important and positive exchange which was important for the ongoing dialogue. At the event, the speakers are Chief Rabbi Arie Folger, Vienna, Archbishop Georg Gänswein, Prefect of the Pontifical House and Private Secretary of Pope em. Benedict XVI, Dr. Andrea Monda, director of the Osservatore Romano, Dr. Elio Guerriero, author and publisher as well as Prof. Achim Buckenmaier, director of the Chair for the Theology of the people of God. Benedetto XVI in dialogo con il rabbino Aria Folger: Ebrei e cristiani. The event is public. The Chair invites you to participate.